​The simplicity of camping is what appeals to many people. Being in nature with just the simple things is relaxing and a welcome change from our busy lives. But just because you are camping does not mean you have to give up all of your comforts. Some people can sleep on the ground with a sleeping bag and be perfectly happy. But for others, that is not their idea of a vacation. If you want to make your camping experience more comfortable, you should consider investing in a good air mattress. A good air mattress will help you get a good night’s rest so that you will feel refreshed the next day. There are tons of air mattresses on the market so we have put together everything you need to know to choose the right one for you. First, we will discuss the different types of air mattresses, then we will give you a list of the top ten best camping mattresses currently on the market. Then we will discuss all the other details that you need to know about air mattresses. Coming in easily at number 1 is the SoundAsleep Dream Series air mattress. 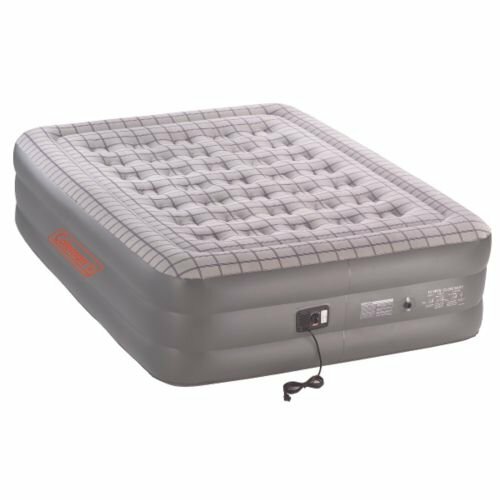 Featuring ComfortCoil Technology, this air mattress has 40 individual air coils so that it maintains its shape and fullness. This design ensures that the bed stays flat and firm. You can use the built-in pump to adjust the firmness, ensuring that you stay comfortable. The double-height construction offers you the comfort of a traditional mattress. The built-in EZ pump fully inflates or deflates the air mattress in 4-minutes and it is 20% quieter than its competitors. The SureGrip bottom material prevents the mattress from sliding around and provides a suction grip on hard surfaces. Store the mattress away in its included travel bag when you aren’t using it. 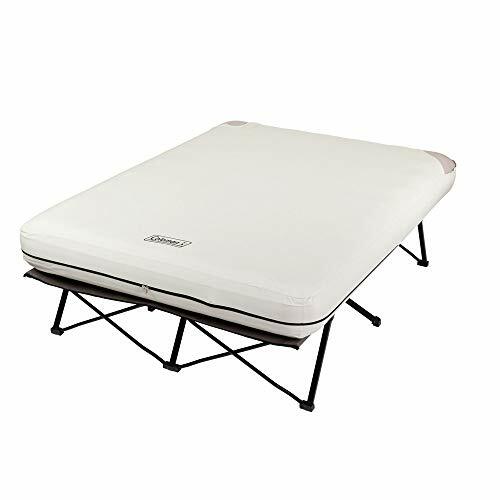 Featuring a Fiber-Beam construction, this elevated airbed offers better comfort, stability, and support. The air chambers are horizontal and keep the bed firm, offering you more support. The waterproof plush flocking is soft to the touch for added comfort. Inflating and deflating is a breeze using the built-in electric pump. The mattress fully inflates in 4 ½ minutes. You can also use the pump to adjust the firmness to your liking. The sides of the mattress are indented to prevent your sheets from sliding off of it. A duffel bag is included for easy storage. This is a great air mattress for a budget-friendly price. Featuring Insta-Bed’s NeverFLAT™ pump system, this air mattress has 2 pumps to keep you comfortable throughout the night. The primary pump is used for inflation and deflation, as well as to adjust the firmness of the mattress. The secondary pump silently and continuously maintains air pressure throughout the entire night, according to your settings. This means that the air mattress won’t lose during the night. Use the auto inflate/deflate buttons so that the pump automatically shuts off once completely inflated or deflated. The materials of this mattress are puncture-resistant and the circular coil system provides support, ensuring a flat surface to sleep on. The Sure Grip bottoms prevent the mattress from sliding around as you move around in your sleep. 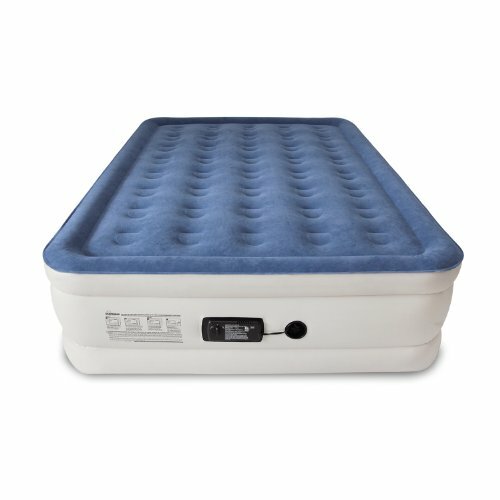 This Serta air mattress also features the 2 pump system for easy inflation and deflation, as well as maintaining air pressure to keep you comfortable. It also has the auto-shutoff feature. You can also customize the firmness level to your liking. Thirty-five circular coils ensure a level and supportive sleeping surface. The puncture-resistant and water-resistant durable flocked top is soft to the touch. This makes it more comfortable for you and also prevents your sheets from sliding off. 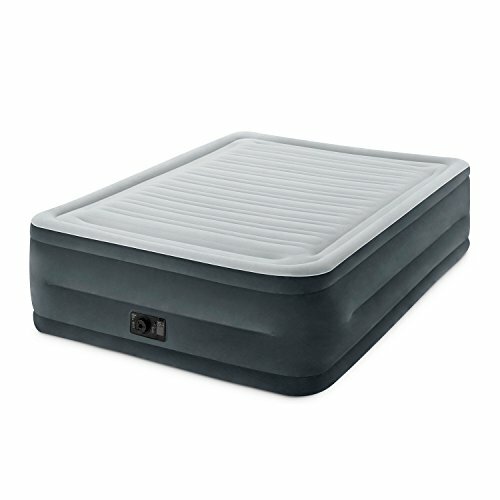 This air mattress is raised, making it easier for you to get in and out of bed. The Sure Grip bottom keeps it put during the night. The ComfortStrong Coil construction eliminates bulging, creating a firm and flat surface. The raised edge at the head of the bed prevents your pillow from sliding off. For extra comfort, the top of the mattress is a soft suede. To make inflation and deflation easier, the built-in pump does all the work for you. The airtight system with a double-lock valve prevents air from escaping, keeping your mattress firm. Use the pump to adjust the firmness. A zippered storage bag is included to make it easy to take along on your camping trip. Elevated on a cot, this airbed will make you feel like you are sleeping at home. It has 2 side tables with cup holders where you can keep drinks or personal items. The airbed and cot fold up easily into the included carry bag. The soft, water-proofed flocked top provides you with a comfortable sleeping surface. Using the hand-held battery pump, you can inflate this air mattress in just 2-minutes. It has a compact packing size for easy storage. 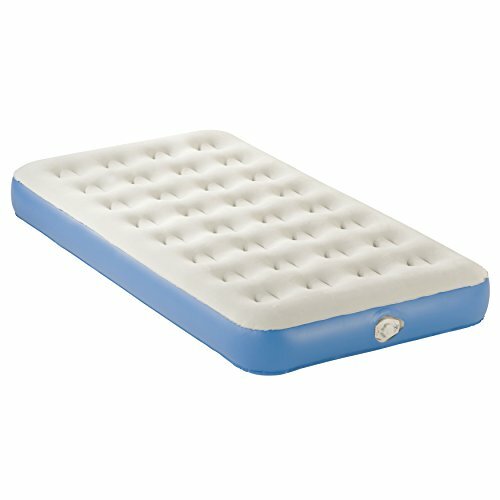 With 35 comfort coils and a soft top, this air mattress is comfortable and provides great support. The Support Lock Reinforced Construction keeps the bed stable when you move around. 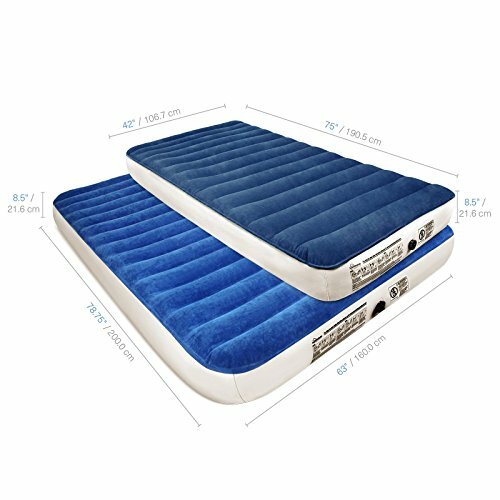 Designed specifically for outdoor use, this SoundAsleep Camping series air mattress is made of extra thick materials to withstand the outdoor environment. Using the external pump, the mattress inflates in under 3-minutes. 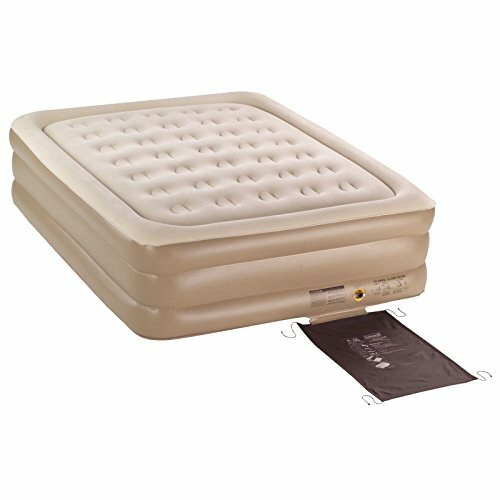 This durable air mattress is made of heavy-gauge, puncture-resistant PVC vinyl for superior durability. The oval coil construction provides excellent support, helping you sleep better. The flocked fleece on top makes it a comfortable surface to sleep on. Before deciding which size to get, think about how big your tent is. If you have a small tent, a queen air mattress will not fit. Queen mattresses are great for couples that have a big enough tent to fit it in. If you have a smaller tent or want to buy an air mattress for children, consider buying a twin size mattress. Whichever size you choose, make sure there will still be room left in your tent to put your supplies. Whether you get a lighter or heavier mattress depends much on your preferences. Also, if you will be camping close to your car, weight is probably not much of an issue. If you will be camping a distance away from your car and you have to carry your gear, a lighter mattress will probably be best. Keep in mind that heavier mattresses are generally more comfortable and durable. No matter what your budget is, there is an air mattress out there for you. Lower cost air mattresses are generally not as durable and don’t have all of the convenient features of the more expensive options. But if you are a person that doesn’t need the extra gadgets and gizmos, a simpler and lower cost mattress can be the way to go. If you are looking into buying an air mattress, it is most likely because you want to make your camping experience more comfortable. Many comfortable air mattresses have a soft top for a better feel and so that you don’t slide around on it. One of the biggest pet peeves people have with air mattresses is them losing air. Many people know how annoying it is to try to sleep on an air mattress when it has lost its firmness and you feel the air moving around. To ensure this doesn’t happen to you, pay attention to the construction. Many good quality air mattresses have different kinds of coils inside them to keep the mattress firm. Some air mattresses have built-in pumps that continuously monitor the air pressure to ensure that they always stay firm. Of course, you don’t want to shell out a bunch of money for an air mattress and then only have it last you just a few short years. Pay attention to the kind of materials used and if it is waterproof. It is better to pay more for an air mattress that will last you many years than purchasing a cheap one that you will soon have to replace. This is an important factor especially if you plan on camping regularly. Also, pay attention to the warranty offered. Most air mattresses have at least a one year warranty. We have already discussed the different types of pumps: external and internal. External pumps can further be broken down into a few more categories. Built-in pumps are by far the easiest and you never run the risk of losing your pump. They also offer the option of adjusting the firmness of the mattress. Some air mattresses with an external pump are cheaper so keep that in mind as well. In order to pick the best camping mattress for you, you first need to know which type you want. There are raised and low mattresses. Most air mattresses come with a pump, there are 2 kinds of pumps- external and built-in. These are key features that you need to know about in order to pick the best one. The most popular air mattresses these days are the raised type. They are usually as tall as a regular bed, giving you the same comfort of your bed at home. 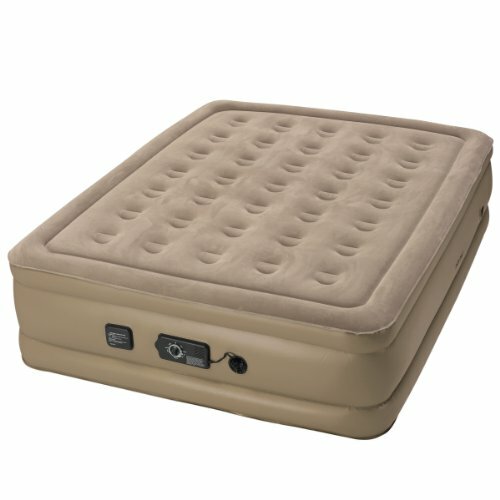 Raised air mattresses are easy to get in and out of. They are very comfortable and offer great support. The only downside is that they have a bulkier packing size. Low air mattresses are thin, without the tall platform that raised air mattresses have. They are lighter weight than raised mattresses and have a more compact packing size. So if weight and size is an issue for your camping trip, you will probably want to go with a low air mattress. There are different kinds of external pumps- battery powered pump, hand/foot pump, portable pump, and electric pump. Battery powered pumps run off a pair of 4D batteries and are great to use if you are far from a power source. Electric pumps can be a bit bulky to carry if you won’t be camping close to your car. Electric pumps either have to be plugged into your car’s 12 V outlet or into a generator or wall outlet. Remember that AC plug ins have to be plugged into a wall outlet and DC plug ins are for plugging into a car’s 12 V outlet. Hand/foot pumps are lighter weight and are ideal if you won’t be close your vehicle. Air mattresses with a built-in pump are becoming increasing popular. Many of the best air mattresses have them. They are so easy to use and do all the work for you. They are either battery or electric powered and inflate quickly. Another benefit with built-in pumps is that you can adjust the firmness of the mattress according to you personal preferences. Choosing a good quality air mattress is an important part of your camping gear. For some of us, a sleeping bag on the ground just doesn’t cut it. Since the whole point of getting an air mattress is do bring some of your indoor comforts to the outdoors, it is important you know how to choose the best one for you. First decide which type you want, low or raised? With an external pump or built-in pump? Will a queen size mattress really fit inside your tent? Be sure to pick the right size. How much money do you want to spend? A more expensive air mattress will generally be more comfortable and durable than a cheaper one. But if you just want something simple without many additional features, you can go for a cheaper option. Our list of the top 10 will be a great aid in helping you make your selection since those are the best ones on the market according to user reviews. If you want to dig deeper, read some of the reviews for yourself to feel more comfortable about your purchase.